What a delight to see Creation reproducing itself as God commanded. We have so many new babies in our bird world here at Bluebird Cove. One rainy day I sat at the kitchen table at the window and watched the baby wrens wait for their parents to return with food. They had fledged the nest but still weren't accepting the fact that they were soon going to feed themselves. So they huddled there, jumping around a bit, testing the newly discovered delight in what wings were for. Being used to staying in bed all day, they would close their eyes now and then for a few winks of sleep. What a picture of rest and trust. When they would hear the call of their parents they would get excited and flutter those wings a bit with open mouths. It reminded me of us resting and trusting that God will feed us and take care of us. Sometimes we operate strictly from sheer will power and I've been wondering if that's really the best plan. 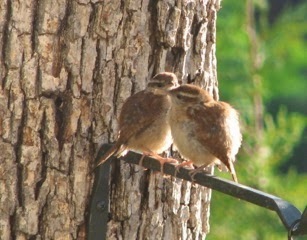 Jesus told us we need to be as children .... so my recent visual of these baby birds is continually crossing my mind. 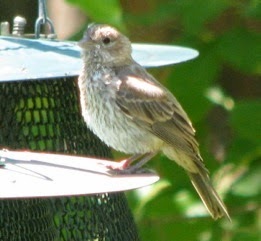 Besides wrens, we have baby house finches. Oh my! Talk about chattering children! Finches are known for their singing but it seems you can't get the babies to be quiet when they're waiting for food. Much contrast to the wrens, eh? They stood on the branch and chattered away running after the Papa. You could just hear the begging urgency of their tone trying to convince him that they only had moments to live if they weren't fed quickly. Doesn't that remind you a bit of you and me? Chattering and begging away for God to do something for us and more importantly, to do it now! There's a few babies in progress also. 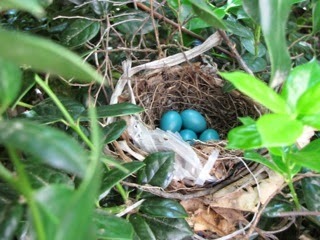 A cardinal's nest in the area of our habitat called Cardinal Corner had 4 eggs in it when I took photos. We had almost a week of rain and that Mama sat on the nest faithfully. What a testimony to motherhood, an honorable treasured role of life for many women. We see much devotion to offspring in the animal world. Mrs. Cardinal comes to the covered front porch where we have a feeder full of millet and safflower seeds (so the squirrels will leave it alone). During the rain she was drenched. The spot she picked is a nice sunny one with an opening towards the morning sun, but the rain blew from that direction so she endured, as mothers are known to do. The Papa would join her at the feeder with treats of worms or a sunflower seed from another feeder out in the rain. How sweet! Would that all husbands be so attentive during the challenging years of being a mom. There are four (4) bright blue eggs of the Gray Catbird couple in the front of the house in a dense holly bush jungle by the garage. I enjoy their long lilting songs. They are members of the same family as mockingbirds and thrashers. All have the ability to ramble on with various calls copied from other species and some of their own melodies. A couple of years ago, I was Romanced by a Brown Thrasher. Then there's the Tufted Titmouse family nesting in one of the bluebird boxes. We offer equal opportunity housing, so anybody can use the bluebird boxes. We have 7 of them and actually we knew from the locations we chose that some would not attract bluebirds because they were not in an open area. Sometimes I feel like I've taken up residence in some other species abode. There are times when we just don't feel like earth is "home." The female Mourning Doves are waddling about with the males fast behind them cooing and begging for attention. 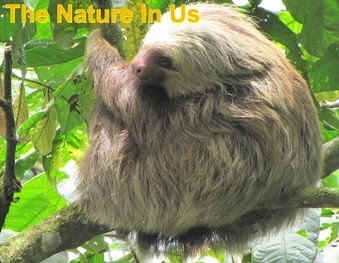 Males begin to sing in the spring as the levels of their male hormone, testosterone, rises. Their sound is a delightful one and doves always remind me of peace regardless of the color. Seeing the males chasing makes me think of how Jesus pursues us even when we think we don't need Him. Oh, the woodpeckers! 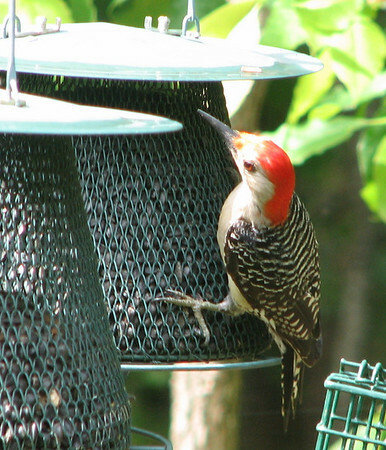 Red-bellied, Pileated, Red-headed, Downy and Hairy are common to our backyard which is forested for acres behind us. Although I don't like to see trees die, I smile because I know they bring life to many birds including all species of woodpeckers that need them for nesting and food. And we need woodpeckers to save our healthy trees from which they glean bugs that could kill the trees if they were not gathered for a meal. We have baby bunnies also and they are so furry and cute. During the winter we had an adult that wintered over behind our front bushes against the garage. We eat a lot of veggies and fruit, so we have a lot of food that is scraps to us, but dinner to wildlife, so we put out apple cores, ends of carrots and other veggies. Since the bunny bushes are at the end of the front porch, it's easy to dump them there. Of course, it's not just bunnies that eat them. We enjoy the opossums, skunks and raccoons too, so they all share in our habitat. Sharing .... hmm, that bring the crows to mind. They're not much for sharing, or maybe it's just their sheer size that intimidates the smaller birds causing them to flee. They are willing to share with other crows since they live and roost in great numbers. They're definitely into the social scene and love to alert others of a find of food. One thing for sure is the squirrels don't enjoy sharing with anybody. One of them chased away a rabbit that was feeding beneath a bird feeder. I keep telling them it's not nice not to share, but they totally ignore me, as squirrels do. I would say squirrels definitely portray the saying, "If it's to be, it's up to me." Surely they expend more energy keeping other squirrels away from food than the energy they get from eating it. Sadly the word "greed" comes to mind. There are those who hurry and worry over getting enough and it seems for those folks, there's no designated limit of what is enough, so the unfulfilling quest goes on for man and beast. Wildlife watching is certainly food for the soul. I hope you take time in your life to enjoy it. There are many lessons to be learned within Creation because the fingerprint and character of the Creator is in it all.